Most people agree that a vacation is supposed to be relaxing, but planning for one can be just the opposite. Still, poor planning can cost money and time, causing headaches and frustration when you're supposed to be getting away from it all. Some people like to book a ticket and see where life takes them. Others prefer cruises or tours where the planning is taken care of for them. I prefer to plan my trips, researching and budgeting as much as I can while I'm at home to make the vacation as smooth as possible. If that sounds like the route for you, today I'm going to share my method, step-by-step, for budgeting and planning a vacation, including spreadsheets you download and customize. Stuff like that isn't fun when you're on vacation, so let's avoid those hassles. Pick a destination, and start planning. Most travelers find that there isn't just one guide that covers all of their needs. Some books cover the logistics — where to stay and how to get around the city. Others might focus on history, culture, and the arts. Then there are some that are even more specific, like biking through the Netherlands or kayaking in New Zealand. Get one book that adequately covers the basics and at least one that covers your personal interests. Planning tip: Check out several guide books out from your local library to get a feel for the writing style. If you like one, then purchase the latest edition. This also saves money if your trip is more than a year away. Travel guidebooks quickly become outdated, so it's very important to purchase the latest edition to take on your trip. Do the accommodations and restaurants fit your budget? Do you like the layout? Is it easy to find information? Does it have detailed maps? Does it cover your primary travel interests, such as history, culture, food, markets, safaris, ecotourism, farm stays, hiking, etc.? Does it make you feel even more excited about your trip? If you plan to visit only one specific region or city, or if you just plan to spend the bulk of your time in one, consider a regional or city guide with more specialized information. Rick Steves' Europe Through the Back Door. Steves believes in making travelers “temporary Europeans.” From his book: “The more money you spend, the bigger the wall you build between yourself and the culture you traveled so far to visit. Stay in the small inns, eat in family-style restaurants, visit out-of-the-way places, rub elbows with the locals. You'll spend less money and have a great time in the process.” The guidebooks include tons of practical information about where to sleep, eat, how to use public transit, budgeting, historical sites, maps, and more. Steves' book got me from Rome to Pompeii, and I saved $50 over the route that others in our travel group used. Lonely Planet. Perfect for logistics, but you'll need to supplement with another book for history and in-depth cultural information. This series is especially good for long-term travel, as is gives extensive information about where to stay, how to get around, etc. Frommer's. Another series that advocates living like a local, but is very extensive in the destinations it covers. A book from this series helped me to rent a car and successfully drive around the Yucatan peninsula, use toll roads, and not get lost once. Fodor's Guides. There are several series of Fodor's travel books, each written for a different type of traveler. Fodor's uses local writers to give readers the most accurate information and inside knowledge. Let's Go. If you're a student, or just on a student's budget, this guidebook series is one to consider. Written by students, there's information on all things cool and free. Also check out Budget Travel for articles on your destination(s). I've found some great hotels written up in Budget Travel that were out-of-the-way and not as popular as some of the ones listed in the big guidebooks tend to become. How many days do you have for this trip? Enter that number into the yellow box. Where do you want to go? List each city in the column to the left. How many days do you want to spend in each location? Enter those numbers into right column. If the difference is negative, you need to earn some more vacation days or make some cuts to your itinerary. Don't try to pack in too much. If you spend all of your time jetting from point A to point B, you won't see as much. What is most important? Be sure to check your guide books to see how much time is recommended for each place. Use the guidebooks to estimate expenses for each item in the Activity section, and enter those into the Expense column. If I'm staying at one hotel for three nights, I typically list the expense just once on the first day I'm staying there, but you can list it on each day if you like. You'll need to search online for airfare and train estimates. For airfare, check out the big sites, like Kayak, but don't forget to look at budget carriers, too. Fellow GRS staff writer Adam Baker wrote a great guide, 5 Little-Known Websites That Will Save You Time and Money When Booking Airfare Online. Adam writes, “In most cases, the cheapest fare will be found using a combination of sites depending on your specific travel plans.” Try lesser-known websites when searching for the lowest airfare. For rail travel in Europe, Rick Steves provides a comprehensive guide to Eurail passes, including how they work, how to plan your trip, and cost comparisons. Include any mode of transportation you'll use, whether it's rental cars, buses, taxis, ferries, or elephants. In the Notes column, include important details, such as hotels that only accept cash upon arrival, offer continental breakfast, or other important details. Now use your books to estimate meal expenses (plus tips) under the Food section. I like to find budget hotels with complimentary breakfasts, which can reduce expenses a bit if the hotel comes at a good price. If the primary reason you're going to Italy is to dine like royalty, however, by all means, add that in there. You can toast to me with your glass of Brunello. If you like souvenirs, add a budget for that expense. Personally, my favorite souvenirs are photographs, which weigh no more than my digital camera and cost nothing. Add any other expenses in this section. For example, if you are renting a car, add in an estimate for gas. You should have an estimated grand total for your trip. Is it in your budget? If you haven't started saving for the trip, how many months until departure? Divide your trip cost by the number of months until you leave to find out how much you'll need to save each month. If you can't save that amount, reassess your trip plan or the departure date. You have a budget and an itinerary, and you're ready to start making reservations. As you make reservations, enter whatever you're paying now in the Pre-paid column, and the amount due on arrival (DOA) in the DOA column. Fill in times associated with each activity where appropriate, especially for departures and appointments. You don't need to schedule every minute of every day, only the activities with a time frame associated with them. For example, if a museum you want to visit closes at 1 p.m., that's something to write on the itinerary. If you want to see a show that starts at 7 p.m., that's another important detail to note. Planning tip: As you make reservations, save receipts, confirmations, and e-mails for air, hotels, and anything else that required a deposit. Just stick them in a folder until you've finished booking your trip. One page with emergency numbers, such as the nearest U.S. consular office. U.S. embassies or consulates can provide assistance if you need it. Go to the U.S. Department of State to get contact information for the area(s) in which you will be traveling. Take this stack of papers to a print shop and make a spiral-bound copy for each person traveling with you plus an extra copy to leave with a friend or family member. It's a bit of work upfront, but it saves you a lot of hassle on your vacation if you have an itinerary and important information at hand, and you won't be shocked by a massive credit card bill when you come home. Plus, if you give a copy of your personalized travel guide to your mom, she might not nag you quite as much for going white-water rafting in Nepal. J.D. 's note: Kris and I have recently become avid watchers of The Amazing Race. Between watching that show and reading April's article, I'm dying to get out and see the world. To celebrate the completion of my book, we'll soon be taking a trip to Belize, but I want to do even more! There are 58 reader responses to "Planning a (Debt-Free) Dream Vacation". This is exactly how I planned my honeymoon this past summer and I loved it! Everyone judged me and my spreadsheet – I though it was awesome! When unexpected things come up (a storm was arriving so we had to travel onto an island a day earlier) I knew exactly what I was planning for that day and what I would be missing, plus what reservations, if any I needed to cancel and by when to avoid charges. Plus I came back with no debt just a bunch of great memories, and I got to do basically everything I wanted in one 2-week trip. I am the family vacation planner and they tease me sometimes about my thoroughness. The one thing I haven’t done is the expense and itinerary planner. I’ll use this idea for our April vacation. Thank you for the information! Your actual vacation cost will always be 50% – 100% more than you estimate, no matter how hard you try. Keep this in mind and add it in to the budget. We took a trip to Iceland last September that would have been improved mightily on the logistics front had we followed some of your tips, April. This article will be very helpful in the future. Thanks! I actually did almost exactly this for my trip to New Zealand in early October 2009. I’d been planning (and saving) for a trip to Kiwi country in the summer of 2010, but when I found really, REALLY good prices for flights, I decided to move my trip up by almost a year. I bought my airplane tickets in March 2009, so I had plenty of time to save. As a woman in her late twenties, I wasn’t sure how I would get around while there, so I planned on joining up with a young adults tour for a big part of the trip. Joining the tour saved me money (and lots of worry ) in the long run as most of my hotels and transportation was covered, and I was able to explore so much more of the North Island than by myself. I knew what most of the extra cost “optional excursions” I wanted to take, so I added that cost into what I was saving. By having money saved up, I was able to take my debit card with me, and I saved on currency exchanging costs by simply taking cash out while there. Anything else, I put on my credit card. Then, when I returned, I was able to pay everything else off by the end of October, and now all I have left are memories of good times and new friends. 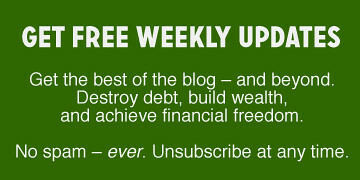 I never would have been able to do that before I found Get Rich Slowly (and other PF blogs) several years ago. Thanks for the great article, April! And keep up the awesome work, JD! Matthew, I’ve planned my vacations like April, and never have gone over by 50-100%, I’m usually right around the correct amount, but never more than $100ish over. But to double the cost, holy cow! If you double the price of your vacations you obviously aren’t planning for it at all! Thanks for the informative article, April. I travel often, and like doing pre-trip research on restaurants in the area. I read reviews, ask locals for advice on travel forums, and compile a short list of options before I leave. It’s a great way to get a good meal, and avoid overpriced tourist traps! However, I disagree with the spiral bound notebook. My strategy has been to get everything on one to tow pieces of paper. Fold these up and put them in your travel wallet (you do have one, don’t you?) in case other things get stolen or lost. It is much less of an inconvenience this way. If you need immediate access, make a copy WITHOUT your passport info and stuff it in the front pocket of your suitcase. We’ve had great success with finding apartments and homes for rent on vacation the last few years. With a family, it’s easier to do breakfast in a place with a kitchen, and other meals and snacks. Our first stop after dropping our bags is to find a local grocery store and purchase what we think we’ll need for the week. We generally know that there will be some days that we’ll be sight-seeing, and won’t want to cook so plan on eating out. We can easily pack a picnic to take with us on those days, too. Food costs can be really high, and this is one way we are able to cut back, and then splurge on another aspect of the trip. BUT my most memorable trips (in a good way) have involved exploration, getting lost, needing to talk to locals for recommendations, help, directions, etc., and having the freedom to wander. That said, not having everything buttoned down might make some people more anxious and less able to enjoy their vacation. A couple more Tips: If you are traveling to a third world country — I would definitely use but wouldn’t fully trust a guidebook (no matter how recent the edition). I would also be hesitant to “prepay” for any hotels until you have seen your room unless you are in a major city. Finally, I would say that the best resource for any trip is a friend or just any contact who has traveled or lived in your destination! I don’t think the two are mutually exclusive. In fact, I feel planning everything out gives me the freedom to improvise whenever I want, and I can make my way back to the original plan at any time. The difference, however, is that by planning ahead I can keep my trip within a set budget, and not end up spending money on unforeseen circumstances (which are practically guaranteed to happen when you don’t plan). My husband and I went to Ghana last March for our friend’s wedding. It was such a wonderful experience and we enjoyed so much the culture, friendly Ghana people, food and their everyday work and life. If you are like us, love to know new people and learn the cultural tradition, oh and don’t mind bugs/heat/humidity/no AC.. you will really enjoy a trip to Ghana. We would like to add the TravelAdvisor website where people share travel information and advices. For guide books, The Bradt Travel Guides are really nice since they talk a lot about culture and the real life, list things in several budget categories. And don’t forget to check those guide books at your local libraries. We found the Ghana – The Bradt Travel Guides at our local library. After the trip, we clear-taped 1 Ghana cedi (the smallest paper money) into the book before returned it to the library. And the last thing, check with the embassy of the country that you are planning to visit in order to get all update information about visas, health issues, etc..
@Bon–Agreed! I actually like getting lost and I make it a point to talk to locals about their recommendations. You should never plan every second of every day, only the things that are most important to see and do. In fact, it was a random, local Italian man who put us on the right train to Pompeii. You are definitely right that the guidebooks can only take you so far! I love the spreadsheets for bird’s-eye-view planning, but agree that you don’t want to take it too far. For me, the best times are had by getting the big ticket items locked down and setting a strategy for once I’m there, but leaving enough open ended details to allow for plenty of exploration and unexpected finds. I also can’t recommend enough using whatever method you can to connect with someone local. It changes the entire experience. JD, I just got back from Belize the other day and it was a great place. I wish I could have been able to spend more time there to really explore the country a bit more. The food was great…I’ve never had better rice and beans in my entire life! They cooked them with coconut milk and it was just fantastic. Have a great trip and I look forward to a full report when you get back! I can’t say enough good things about Rick Steves! I think you can also watch some of his shows on Hulu.com. One thing I’ve forgotten to factor into the cost in the past is pet care. :/ If you have friends who can watch your pets, you’re set, but if you need to board them or hire a petsitter, that cost can add up fast — pet care over a standard 9-day vacation can easily run $300 or more. I went to New Zealand too, just like the other Leah (but I went in 2006). I went for three weeks and figured I needed around $3-4000, depending on what price I could get for airfare. I’m a hostel-sleeper, bus-taking type of person, and I had two friends in NZ who would let me crash with them for awhile, which saved me something like $200NZ. I worked with a travel agent to get a great flight for $1,300 from Seattle -> LA -> Auckland and then back from Queenstown -> Auckland -> LA -> Seattle. Strangely, I didn’t plan my trip too well, but I know about what things cost and figured that $1,000 worth of cushion in my budget would do me fine. I actually did most of my planning with my Lonely Planet on the way there, and the hostel I stayed in just happened to have a travel agent who showed me the ropes of the country bus pass and saved me tons. In the end, I spent just under $3k USD on my trip, including the airfare. I think I ate in a restaurant 2 or 3 times total; otherwise, I cooked my food in the hostel kitchen or ate a cheap meal at a little counter place. I would watch what the locals would do and follow them. Much better to get my succulent (and very Kiwi) meat pie for $2 NZ than to spend $11 NZ in a restaurant that served things I know I could get at home. I ate a lot of PBJ too. But I went to NZ for the activities, and I totally whooped it up in terms of kayaking, spelunking, river surfing, etc. It was awesome, and I’d totally do the same again in a heartbeat. Outdated or not, I would never tear up a book! Photocopy the pages you need instead and then on your trip, you can toss the sheets as you ‘use’ them. Donate the book instead . . . someone out there can use it! Another tip? More of a safety tip though. When traveling make sure you have a nice clear photo of the people you are traveling with. If someone in your group goes missing, esp a child, you want to be able to have a color photo with you that you can physically hand to police. So many people travel with photos of loved ones saved onto iphones, PDAs, other cell phones which is good, but not useful if you need to circulate someone’s photo quickly in case of an emergency. If you have a photo of your child, you can hand it to police who can scan it and get it out widespread. No one really looks like their Passport photos, so its good to have a recent photo handy. 1) Pick a place that sounds interesting. 4) Buy a Lonely Planet. 5) Figure the rest out when you get there. I don’t know why people think books are sacred. They’re just paper. Do you care about throwing away yesterday’s newspaper? Why a book then? Thanks. This is great. It seemed over the top but once I downloaded your template, its easing my frustration. I’m planning a debt-free wedding in Vegas for April so all the little extra costs count. I recently have done this and had a debt free vacation. It’s all about planning. Once you have the idea range of what you want to spend, then set up a time limit to save for that and then work on saving and learning more about the trip. It’s a great feeling to go on a debt free trip. I am in no way affliated with the site, but I cannot stress how gret GO-TODAY.COM is! Their most popular packages include 6-night + air to Paris for around $700! I’ve taken two trips through the site – London & Athens, and both times were superb. Good lord… what a lot of detail! I’m going to Vegas in March with my sister. She researched the best deals for a while on Expedia and those other travel sites, and we booked when we were confident we found the right price and dates. We’ve got a rough idea that we want to see at least 1 show, go to one world-class restaurant, and we’ve already booked a helicopter tour. I usually also budget for spending money roughly. I don’t know that making a huge spreadsheet would help all that much. I won’t go crazy and decide to buy a Maserati or anything while I’m there :P I do have *some* self control. Wow that is a well thought out plan! I am impressed. We’ve been taking debt free vacations since 2007. This is what we do. (1) $50 every pay period goes into our travel/vacation fund ($100 a month). (2) We try to plan vacations well in advance so that we have time to budget. (3) We book the flights, normally we have more than enough in our travel fund to cover the flights for the two of us, or one of us if its a solo trip (I normally d0 a girls weekend a couple times of year). (4) While we do not use credit cards for day to day spending we do use them to book flights and see below on hotels. We then pay off the bill the same day from our travel fund. We use credit b/c it gives an extra layer of protection. (5) We book hotel or other arrangements (i.e. B&B). Again we use our credit card to hold the reservation which means there isn’t generally a charge. We figure out how much the hotel will cost and we add that number to our list. (6) We book rental car if necessary. Again we use our credit card to hold the reservation and we figure out how much the car rental will cost and add that number to our list. We don’t use debit for hotel and car rental not because they won’t work but b/c we don’t want a hold on funds in our checking account. We do, often, pay for the hotel and car rental with our debit card at check out or when we return the car. (7) We normally budget $100 day for spending and if we’ve got plans for a show or a special dinner at a fancy place we estimate and add that to our list. So normally our flight is paid for at the get go from our travel savings. We total up hotel, rental car, $100 a day, other known special costs, we deduct any presently saved travel savings and we come up with our number. Then we set up auto-transfers to our ING travel account and we save a set amount each pay period to meet our number. Then as it gets closer to the trip, we transfer the ING travel savings to our checking account and off we go. We normally take the first couple days of spending money with us, in cash. When we reach our destination, assuming in the USA, and assuming we have a safe in the room we normally withdraw the rest of our daily spending money and we use cash. When we check out we normally pay for the room with our debit card. Having a plan or a budget doesn’t mean we skimp, in fact we normally spend way more on vacation than at home and we stay in really nice hotels. We normally pick up a travel book from the libarary, they are often outdated but things like historic places and walking tours generally don’t change much from year to year. We might book a few special events or plan to hit a particular museum or park but otherwise we are friendly and we ask people in bars what their favorite diner is, favorite shop, favorite art gallery. We never ask what’s the best, instead we ask what is their favorite and we have found some wonderful off the beaten path dive diners that we have really enjoyed. This is more planning than I would do. My vacations usually last several weeks though so I don’t really need to plan much. If I miss something one day I can just do it later. If you over plan your trip you run the risk of turning your vacation into work. @ #3 Matthew – the purpose of doing a good, detailed budget is to reduce that 50-100% to a more manageable level. I have used a system that is very similar to the worksheet here for the last 5 year, and planned over 20 trips from 3 days to 30 days, including one that covered Canada coast to coast with stops in 10 cities – talk about a budgetting nightmare! My general cost overrun is more in the 5-25% range (towards the higher end on longer trips), and usually is not “vacation” expenses, so much as it is buying things that I would normally buy at home but at a better price… like the stand mixer I bought while at Disneyland last month. I saved $100 in shipping because I could bring it back as checked baggage… is that a vacation expense or a household expense?? I think these are all great tips and will return to this whenever we are finally free to take an overseas vacation. For now, we are using our timeshare and doing drive-to vacations. That makes things low-stress and (since the timeshare is paid for) low cost as well. We have a pet-sitting arrangement with a friend who is willing to come in and feed, etc., our cats twice a day for half the cost of boarding them. Everybody is happier this way … especially the cats. Rough Guides are also very good resources when planning trips, especially when you want to get into some adventuring (hiking, kayaking, biking, etc.). Covers wide range of pricing for food, accommodations, etc. The spreadsheet seems like another excercise in making simple complex. I thought I was the only one with spreadsheets! I like to do the “work” ahead of time so that I can relax and have a good time on vacation. I like to have a back up plan of alternate events when STUFF happens. It’s always a good idea to check out local events/happenings in the area as well as the weather for the Month of your travel. Maybe you’ll realize April might not be the best time to take the kids to Palm Springs. When checking customer’s reviews read the bad ones first! Also read the most recent reviews as things/services can change in a year. Look for a few restaurants in the area so you have options and check to see if they require reservations. Just because you didn’t need them in May doesn’t mean you won’t in Jul. This is a great post. I think that using the spreadsheets actually makes things more simple in the long run. This is a great idea, thank you so much! We haven’t had a vacation in a few years and are just now floating where we want to go in 2011. I’ve never planned a vacation, so this will be quite helpful. JD: I just read Jim Rogers’ The Adventure Capitalist and like you, I can’t wait to go out and explore! All in good time, though. I agree with those who say this is too much work. Vacation planning shouldn’t be equivalent to a second job! Be careful how much information you put in one place. If someone loses that binder, the finder has your itinerary, passport information, bank information, hotel locations, phone numbers, etc. etc. Too risky. I budget beforehand and keep pertinent information for each place on one sheet of paper. That can be tucked in a pocket or wallet. The passport and CC info is kept separately, and definitely apart from the actual CC and passport. We traveled Europe and lived by Rick Steves books. His guide was our planning baseline. In terms of the budget, this article is much more than we ever did. I learned to use public transit, use cash only and eat cheap breakfast/lunch. This kept the costs down enough for us. We learned to live like a local, not a tourist – even if it was just for a week. Also, we learned in terms of keepsakes, have an idea of what the area is known for before hand. We kept things to a limit of cost and then numbers. We always tried to think how we would -use- that item in the future. We did a lot gift shopping too. Always ask if there’s a better rate on lodging from the owner. You can save a lot of cash by simply negotiating your room rate. Also, pick your guidebook by its coverage of the country, not by the imprint. For example, Lonely Planet Thailand has been the gold standard for that country, while, last I checked, Rough Guides India was better than the Lonely Planet India. We plan ahead using a less detailed spreadsheet. I am definitely a local budget traveler, so only plan hotels for the first night or for short layovers. I use those prices for the budget process. For the following days, I can usually get a place much cheaper (and often much more interesting) by looking when I am there. We take a local bus tour to orient ourselves when we hit a new big city, then mark our maps with the most interesting places that we want to revisit. I love meeting new people, so often wind up going home with locals or altering my itinerary entirely. No matter how the vacation goes, I budget my lost income into the vacation costs (I am self employed) and prepay my bills for the vacation time and the week after I return. Otherwise the vacation may be already paid for, but scrambling to get the business up to speed after time off is no fun. I loved the Rick Steves Guide to Germany and it was absolutely the best when it came to recommending places to stay and eat. We had some of the best food in the world by listening to him. It’s funny that people are arguing about the right and wrong way to plan a vacation. I think April’s way is great, and as this seems like a site aimed at people who are trying to get out of debt and bad spending habits, I think it’s a great way to be realistic about your budget and aware of how much you spend. On the other hand, if you don’t need to do that, good for you! Some of us love our spreadsheets and I had to laugh at the statement that planning for a vacation is no fun because I love to plan for vacations, even ones I never end up taking. Still, I wouldn’t go to quite the extremes outlined in this post. Then again, I always save more than I need for my vacations and I’ve never come back from a trip in debt, so I feel comfortable estimating and just keeping a mental tally of costs. My personal strategy is to get a guidebook of the country overall and then a Lonely Planet Encounter guide for any big cities I’ll be staying in. They have good suggestions for things to do in the city and day trips, and have good maps. This worked well for my trip to Tokyo and Bangkok and I’m planning to use the same strategy for my tour of Eastern Europe this spring. Since you guys are going to Belize, you might be interested in my husband’s travel tale. Bo-ring! I have traveled on $25 a day with no planning beforehand (zero). It was awesome. Lots of crazy adventures. The travel book was a must for me. It saved me time money and stress on my trips to Moscow, Paris, St. Petersburg and Kiev. I don’t necessarily do the spreadsheet, but I also do the “canned” vacations as friends call them, cruises. LOL. My husband and I really love cruising, we can do anything we want from parasailing to sleeping, and the greatest thing is, our vacations are paid for before we even leave port! We know how much the cruise is, we often book about a year ahead of time, pay for it every month over time, along with putting an alloted amount into a vacation account for planned excursions, cash on the ship, and other things we may want to buy. So by the time we show up at the pier, everything is already paid for, and it’s such a wonderful feeling. My sister in law charged her cruise when she bought it (instead of just making payments interest free to the cruise company), then put a credit card down on account, paid for excursions on the ship with that card, and then had the gaul to make fun of us because we took a cruise without a credit card. I just smiled and nodded, she can think what we wants. LOL. April….wow that’s a ton of planning. I think only a certain type of person would like doing that much work. I’ve always been the planner in the family or even for friends coming with us because I seem to have a knack for ridiculous deals. My vacations seem to always come under budget because the big items airfare and hotel are always super cheap. Let’s face it, unless you are dining at 5 star restaurants every night, air and hotel is going to make up 80% of your bill. Maybe Vegas is the exception but that’s an anomaly. Plan enough trips and you develop a method to get everything at silly prices (including many of the sites that you mention). In terms of planning, I like to have more flexibility than this. We traveled with another family one time where the wife had everything down to 15 minute intervals. In order to keep on schedule we had to cut certain things short and rush through other things. We literally went to a theme park for 45 minutes because traffic took us over 2 hours when it was scheduled for 30 minutes. The woman’s husband who is an old friend had to apologize profusely. My wife would never go for that, we pick out some things that we really want to do and some restaurants that want to eat at and then play it by ear. The problem with planning everything in advance is that it all looks so damn doable on a spreadsheet. By the time you get to your 3rd activity of the day, you are spent and three hours behind. So we like upfront planning of a few major things and then being flexible. For those of you thinking of going to Vegas, I can recommend a publication called “Las Vegas Advisor” . It’s a newsletter published every month, and if you subscribe for a year, you get a coupon book worth every penny of the subscription price. Each month has an advance planner for 2 months out with a list of all the shows and prices, with a smattering of hotel prices, and to make your trip nicer, when all the big conventions and trade shows will be in town, so that you can either avoid them, or like we do, GO! We always rent a car (cheapest available) and end up being upgraded to something nicer every time. The car affords us the ability to stay at an ‘off the strip’ (cheap) hotel and then have the freedom to take our time, and take in the area surrounding Las Vegas for a fraction of the ‘tour’ prices. Long Before we went, I got travel guides from the library, and there’s plenty of free info on the web to help plan. We didn’t tightly plan, beyond the occasional time-limited ‘special’ at one place or another. The rest of the time we just let the day or night take us where we felt like, coupon book in pocket, or we just lounged around the pool. http://www.cheapovegas.com/index.php Has lots of low-budget ideas, and is a hoot to read. For those who might want to try something different when traveling on a budget, you should try camping through Europe. My wife, daughter, niece and I spent 72 days traveling several summers ago. We did a lease buy back on a new 5 passenger Renault turbo diesel van (~33mpg) with a luggage rack and shipped our camping gear to Europe (relatives in Germany) prior to going. It could also be purchased there as well. Camping is super inexpensive compared to hotels/pensions and you truly are temporary Europeans, since many middle class European families camp for their holiday. We purchased tickets six months out and paid cash for them and paid for the car ahead of time (about 2400$ for 60 days with unlimited mileage and zero deductible insurance). We then budgeted about 100$/day for camping fees/food/other. We rarely ate out, instead going to the town grocery store or super market and then cooking our own food. Our itinerary was roughed out but easily changed if needed. We like to go somewhere and stay for a bit so gas costs weren’t outrageous because most places we went to we stayed for 5-10 days. In Germany we based ourselves out of my sister and brother in laws house, and traveled to the Lauterbrunnen Valley in Switzerland, Vienna, Salzburg, Prague, Paris (leased an apartment), the Cinque Terre, and to Bled in Slovenia. For those of you who are skeptical, camping in Europe is nothing like camping in the US. The campgrounds are clean, they have hot showers, most have either a little restaurant or grocery on site, and are located in some pretty amazing places. They are also very safe. It is not a wilderness experience like it is in the US. In all the places we stayed I can’t remember meeting more than four or five US citizens who were camping so you have to be willing to put yourself out there. My daughter went to a birthday party for one of the kids camping while in the Italy and had several sleepovers with two German girls she met in Slovenia (beautiful, beautiful, beautiful-you should go), so it was a full immersion experience. We also used some Rick Steves, Lonely Planet, and Camping Europe books as reference but did plenty of internet research too. Sorry for the long winded post but it is an experience I thing many people would enjoy. LOL, GRS posted on how to plan a once-in-a-lifetime resort vacation while still poor and in debt! I’m been on these types of vacation (thanks, rich BFs!) yeah, they’re fun, but not as fun as the price tag would suggest. Take a road trip to Chicago or NY or LA and spend as much as you want–you’ll still come out way ahead. I think it is worth mentioning that one of the biggest ways you can save money on a vacation is the time of year you take it. There is a peak season for a reason – because that is usually when the majority of people can take their trip. This is especially true for families with school age children. If you are able, booking outside of peak season will often save you 25% to 50% in some cases. And let’s face it, is seeing Europe that much different in Sept than in June? @LiveCheap: Yikes–15-minute intervals!? I completely agree that you should never plan out every minute of every day, just note the activities you really want to do that have a specific time frame. Most of the time we just have a few ideas of what we might want to see and play it by ear. About saving every last travel book, even the old ones. Besides, even though the Eiffel Tower will probably always be in the same place, Paris is a vibrant, changing city. What was a good hotel even 3 years ago may not be anymore. If you want a book with staying power for the sites you should see, use the Michelin green guides. They generally have the overview of the must-see places (rated by stars) with very little emphasis on current info. We’re planning a 3 week vacation to Barbados, and trying to make it as economical as possible. Having done ultra-cheap backpacking trips and no thought all-inclusive trips I think there’s a certain balance between the two that gives to best overall experience. This is amazing! I will be definitely be using this to plan my vacation to the U.K. Thank you! Could you provide again a working link to the excel sheet for Vacation Budget and Itinerary Planner? Thanks!